Okay for those who missed the arrival story of this new figure, you can check it out here. Anyway moving on, now that Gainax have decided to “rebuild” their much loved Evangelion series with 4 new planned movies (2 have already been made with the third one soon), they hope to re-work some of the element to further improve what was already a wonderfully told story. Among these improvements planned was the introduction of a new characters named Makinami Mari. So now Evangelion isn’t just about Rei, Asuka and Misato but also Mari (who happens to be a megane~~~~~ ^_^) and also it isn’t all about a whiny spineless Shinji if Evangelion 2.0 is anything to go by. I had to order this from Play-asia since XL-shop didn’t have this on their pre-order list and I couldn’t miss this chance to complete my Kotobukiya Eva girls! Unless of course if they were to introduced another new eva pilot in Evangelion 3.0 >_< ;; which at this pint may not seem so far fetched with the number of amazing things seen from 2.0. Unlike the previous 2 figure Asuka and Rei, this one comes with an another exchangeable hair bang. The difference is that one has her now trademark red glasses while the other doesn’t. Personally I would have preferred they instead have included a different head, one with her normal eyes and the other with her famous “ZA BEASTO” green eyes! One of the things I noticed with this figure is that it doesn't have the fine gloss finish found in Asuka's version. Though the same could be said of the Rei version. 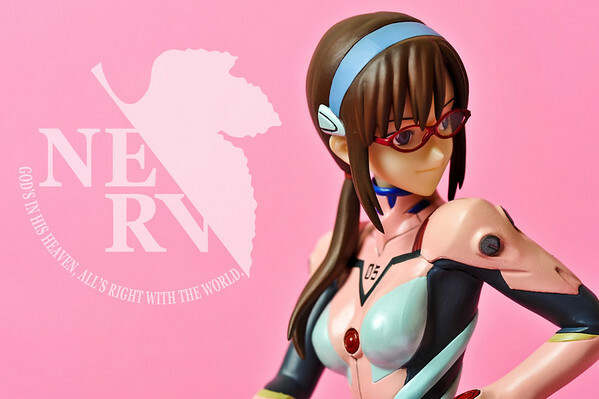 while previous version are given bust of their own evangelion to lean on, Mari's eva bust is that of Evangelion ninshiki (Type-2) in it's secret but powerful "ZA beasto" mode!!! How powerful? Capable of literally eating through Zeruel's AT field! I can't help but feel that they should have glossed this one as well......>_<. Anyway another thing to note is that pigtails are actually flexible. I'm thinking some sort of weak PVC material. So be careful when un-wrapping the plastic around her pigtails, it might snapped off if you pull hard. Nevertheless I really like her characters! Its about time that Eva has a character like this especially when the rest of the cast seem like they need to be placed into a mental institute! Especially GENDO! DIE DIE DIE! This entry was posted in anime, figurines, review. Bookmark the permalink. ← And so stepped fourth MARI~!